Commemorating the Rena oil spill, New Zealand’s worst maritime environmental disaster, caused by the grounding of MV Rena on the Astrolabe Reef. This painting shows a duel as it is also celebrates the beauty and design and the mechanical and practical allure of the Ford vehicle. Car: The Ford Sidevalve is a side valve from the British Ford Motor Company. The engine had its origins in the 1930s Ford Model Y… A selling point for car companies today…smaller cars, smaller engines, more environmentally sustainable! 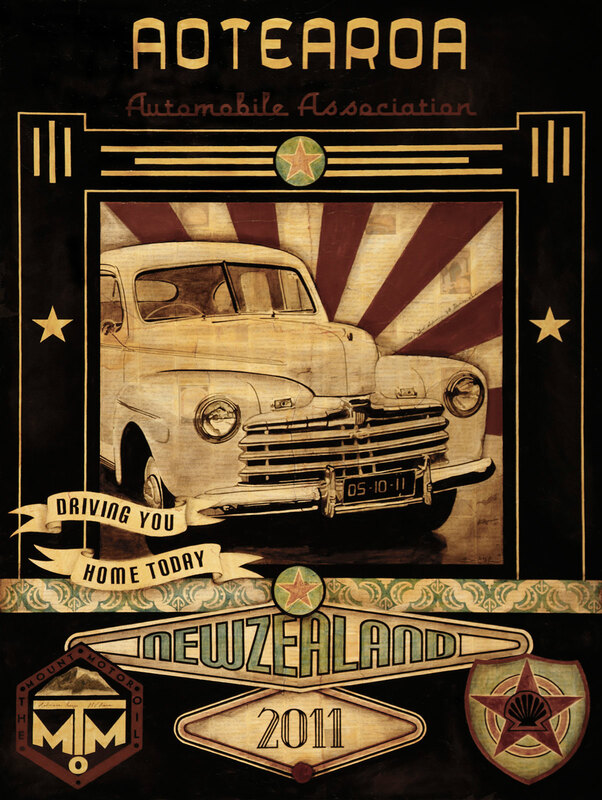 Border design: The border is based on an image I found of a classic art deco car garage. Kowhaiwhai (scroll design): Nga Maunga depicting mountains of Aotearoa. In this particular painting it’s a tribute to Mount Maunganui. The Mount Motor Oil Logo: The common term for Mt Maunganui which is the image inside the logo, referencing the oil that washed ashore. Shield logo/s: This is a generic petrol station logo which brings in elements of the main companies that I grew up with.